Located midway between San Francisco and Los Angeles, Morro Bay State Park (www.parks.ca.gov/?page_id=594) boasts over 2,700 acres of woodland, saltmarsh and shoreline habitat. The diverse ecosystem marks an important stop on the Pacific Flyway, and the park serves as a seasonal home to over 100 species of migratory birds. This coastal refuge is also the site of a sizable great blue heron rookery, where from February to June you’ll find the giant birds nesting in a small eucalyptus grove near the park entrance. And even though the natural environment presents some access obstacles for wheelers and slow walkers, access upgrades have been added to the park, so everyone can enjoy this birders paradise. 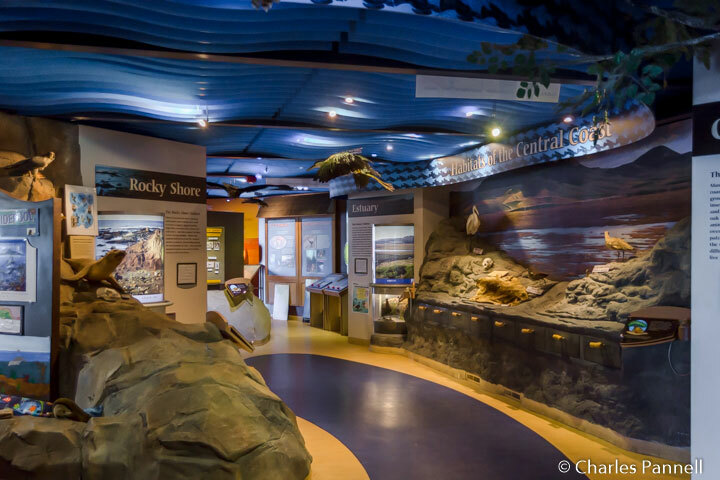 The Morro Bay Museum of Natural History makes a good first stop in the park, as it offers a comprehensive overview of the natural features, geology and avian residents of the park. The museum is located near the park entrance, in back of a volcanic hill known as White Point. Accessible parking is located in the front lot, with good directional signage to the accessible trail that winds around the hill to the museum entrance. And just in case you miss the signs, take the trail on the left, as even though the one on the right is shorter, it’s not wheelchair-accessible. There’s level access to the museum and gift shop, and an accessible unisex restroom is located near the entrance. Inside there’s plenty of room to navigate a wheelchair around the interactive exhibits which focus on the natural features, cultural history, geology, oceanography and wildlife of the area. Volunteers are on hand to answer questions and to help identify the bird life around the marina. 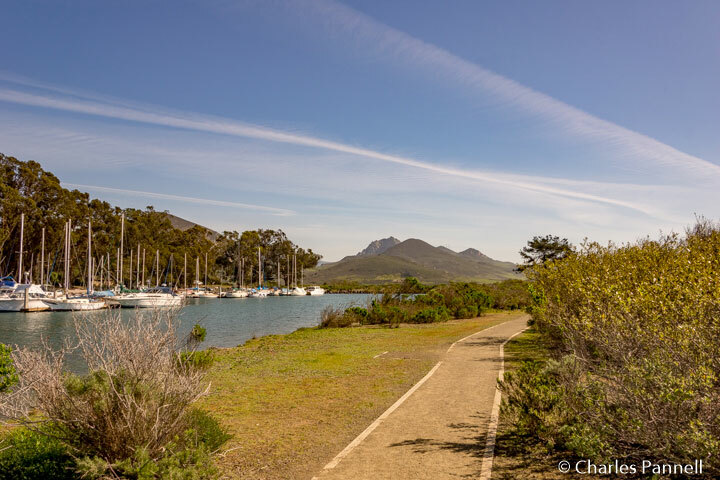 For a closer look at the flora and fauna of the park, head over to the Marina Peninsula Trail. From the natural history museum, continue along State Park Road, then take the first right and follow the sign to the Bayside Cafe. At the end of the entrance drive you’ll find a large parking lot, with the Bayside Cafe at one end, and the trailhead for the Marina Peninsula Trail at the other end. Accessible parking is available near the trailhead, with level access over to the .7-mile loop trail. 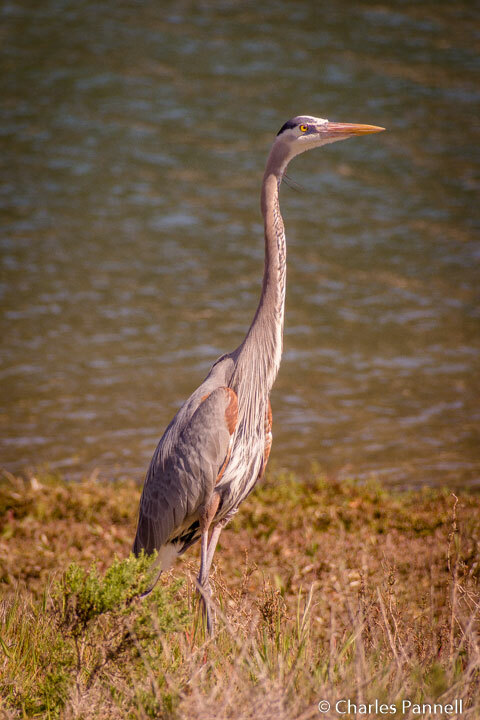 The 36-inch wide paved trail skirts the marina, and since the heron rookery is located nearby it’s not unusual to spot great blue herons in the tall grass near the shore. At the end of the marina side of the trail there’s a shady bench which offers another good view of Morro Rock. 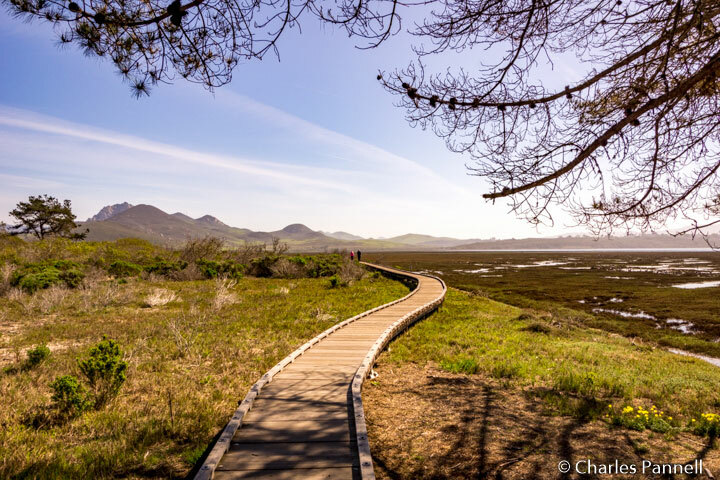 After that, the trail loops back along a wide level boardwalk over the mud flats, where you’ll spy geese, willets, curlews and other wading birds. If you want to cut your stroll short, a dirt trail located midway along the boardwalk loops back to the parking lot. Alternatively, you can continue along boardwalk for another quarter-mile and you’ll end up in the same spot. The Bayside Cafe (www.baysidecafe.com), which is located at the far end of the parking lot, makes a good lunch stop. There’s accessible parking near the public restrooms and level access to the cafe. Menu choices include a selection of soups, salads, pasta dishes, burgers, sandwiches and Mexican favorites. Best of all, you can enjoy your meal on the patio which offers an excellent view of the marina. ‹ Get a Bird’s Eye View in Pigeon Forge	› Best Las Vegas Hotel for Power Wheelchair-User?